Macedon’s iconic Honour Avenue is one of four Avenues of Honour added to the Victorian Heritage Register as part of the lead up to ANZAC Centenary commemorations. The other Avenues included in the VHR are at Cranbourne, Mortlake and Kingston. Member for Macedon, Mary-Anne Thomas, said it was important to recognise these memorials in the lead up to the ANZAC Centenary. 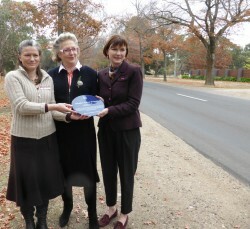 Macedon Mayor Cr Jenny Roberts, Heritage Council Chair Mary Urquhart and Member for Macedon Mary-Ann Thomas with the blue plaque. Presenting a blue Heritage plaque to Macedon Mayor Jennifer Anderson, Ms Thomas said the four new Avenues of Honour added this month, took to 10 the total of Avenues recognised as being of state significance. Ms Thomas said she was pleased with the listing as it ensures the highest heritage protection possible so that any changes or works on the trees would require a permit from Heritage Victoria. “The heritage listing means this beautiful historic asset in the Macedon township will be preserved for generations into the future,” Ms Thomas said. The Macedon Avenue of Honour was officially opened by the Premier of Victoria in 1918 and the 154 pin oaks were planted by volunteers to honour the 154 men and women of Macedon and Mount Macedon who enlisted for service during the Great War 1914 – 1918. “The trees along Macedon’s Honour Avenue are representative of the many plantings that appeared in Victoria, particularly during World War I, commemorating all those who enlisted for service in an egalitarian way where each individual, regardless of rank, was equally recognised for their service,” Ms Thomas said. Veterans Minister Eren said the specialist historical assessments were funded by a $20,000 allocation from the State Government’s Anzac Centenary program. The Kingston Avenue of Honour has individual name plaques attached to each tree to commemorate the service of men and women in the district with Maltese crosses marking those who did not return. Mortlake’s Avenue of Honour consists of 191 Monterey Cyprus with almost all trees still intact, while Cranbourne’s avenue is a short and dramatic planting of oaks. Since the early 1900s, commemorative avenues of trees have been planted in Australia and internationally to honour those who have served in wartime. Victoria has the largest number of Avenues of Honour of any state or territory in Australia with some 218 First World War memorial avenues planted throughout the State and more than 100 commemorating other conflicts.